Topics: Knowledge + Knowhow, Mynxx, Optima, Geneva, Helvetica, and Lucida. 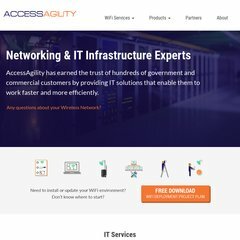 accessagility.com WiFi Scanner for Mac OS X - AccessAgility LLC - Information Access ..
accessagility.com Gigabit Point-to-Point Wireless Bridges - AccessAgility LLC .. The site has about 59 users daily, viewing on average 2.00 pages each. It has 2 DNS records, ns58.1and1.com, and ns57.1and1.com. It is hosted by 1 1 Internet Inc. Pennsylvania, using Apache web server. It is written for PHP/4.4.9 language. PING www. (74.208.52.246) 56(84) bytes of data. A ping speed test response, is timed at 16.8 ms.